DEAUVILLE, France - Russian President Dmitri Medvedev told President Obama privately on Thursday that he now believes Libyan dictator Gadhafi must go, according to a senior US official. That is a big shift for Russia, which has been deeply skeptical of the UN-backed military action in Libya. 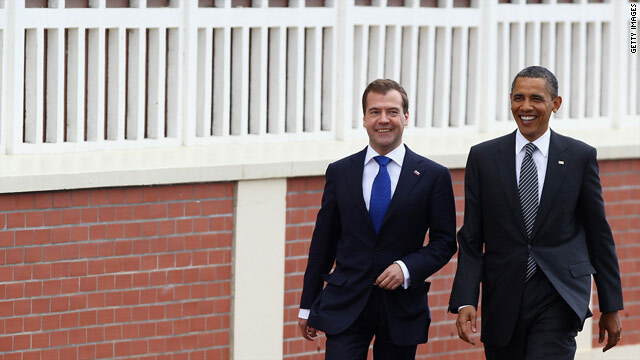 Medvedev's private comments during a bilateral meeting with Obama echo what Russian Deputy Foreign Minister Sergei Ryabkov said on Friday in public at the G-8 Summit. "Yes, we are ready to admit... he needs to go," Ryabkov said, according to AFP. "We believe that Colonel Gadhafi has forfeited legitimacy due to his actions... indeed we need to help him go." The senior U.S. official held this development as a sign that international support for Gadhafi's ouster is growing, a key message Obama has pushed on his tour of Europe. Remember all those things that were going to happen when hell froze over? I think they are happening. If all the opposition is knocked off their chess tables then they can set the rules of the "new game" "change" played exactly the way they want it played, of course in the name of peace or vengence whichever suits the suite played. The Repugnicants keep badmouthing President Obama's "foreign policy" yet he keeps getting positive results. Maybe the "NOTHING OBAMA DOES IS RIGHT" tactic the Repugs always use is as out of touch as Ensign's christian ethics and Gingrich's oaths of fidelity to his many wives. Good to see what the prez can achieve when he doesn't have to rely on republicans.